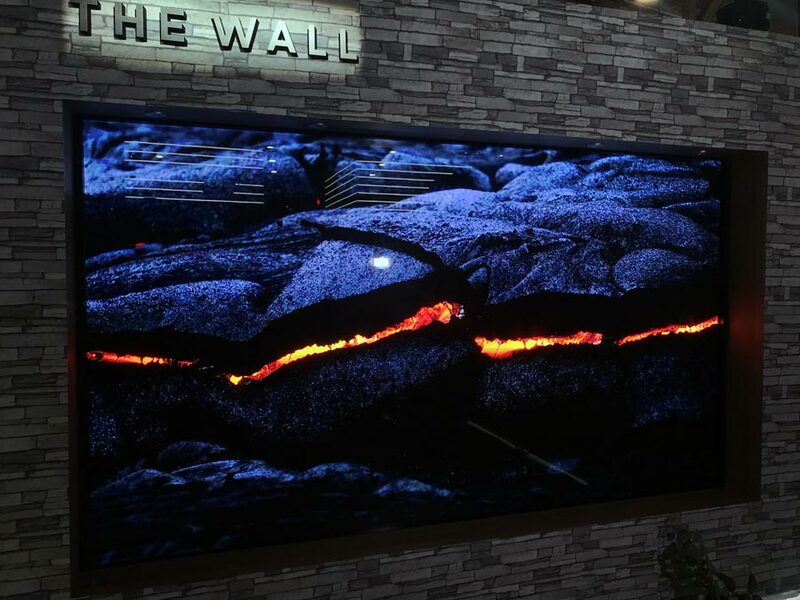 At CES 2018, Samsung showcased the first consumer TV based on microLED technology. It is also the first modular TV. 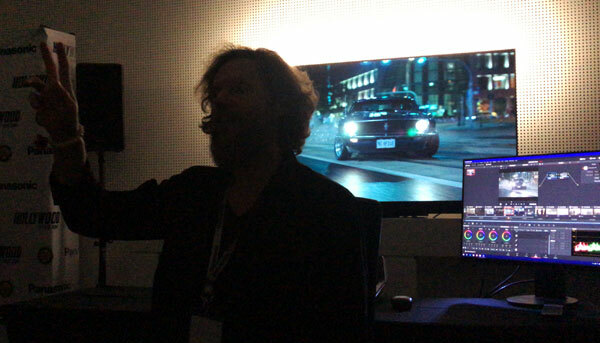 We spent some time with The Wall that produces extremely bright, contrast-rich, and vivid pictures. We had not expected microLED to emerge already. We know that Sony and Samsung are working on getting very large versions of these screens into cinemas but the living room demands a very different type of product. We had heard the rumors but it was still exciting to see Samsung actually unveil the 146-inch microLED TV that it has dubbed ’The Wall’. 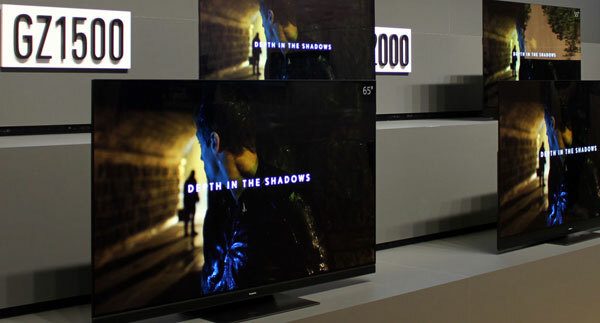 The Korean company has promised to bring the TV to market later this year. Not many people will be able to afford the display, or accommodate a 146-inch TV, but this is the first step. So how did it look? Fantastic. 4K resolution seems a little low for such a large screen but it nevertheless reproduced detailed and contrast-rich pictures with very intense colors. Samsung refused to share full specifications but did says that the display can output 2000 nits peak brightness. It definitely looks much brighter and punchy than Samsung’s current Q9 LCD that also has a claimed peak brightness of 2000 nits. Of course, the difference here is that microLED – like OLED – is self-emitting, meaning that each pixel generates its own light. This also means that it can actually hits those claimed nits numbers unlike edge-lit LCDs like Samsung’s own ”QLED” LCDs that can only reach it with very specific test patterns, which is meaningless. To us, the colors looked even more saturated than DCI-P3. Samsung is currently installing screens based on the same modular microLED technology in cinemas and the cinema version hits around 120% of DCI-P3 so we are likely looking at something similar here. Again, Samsung refused to comment other than say that it believes it can cover Rec.2020 eventually. But it’s not perfect - of course not. During fast motion it appeared to shimmer. Most people probably wouldn’t notice it, as it was very faint. We attribute this to the individual modules that the screen is built from. It is very hard to actually see the seams between the modules from a few meters away but it is visible if you move closer – or if bright ambient light falls on the screen. However, none of this spoiled the experience. The screen is huge and of course size matter when watching high-resolution video content. We were very impressed with what we saw and even more impressed with how far microLED has come. 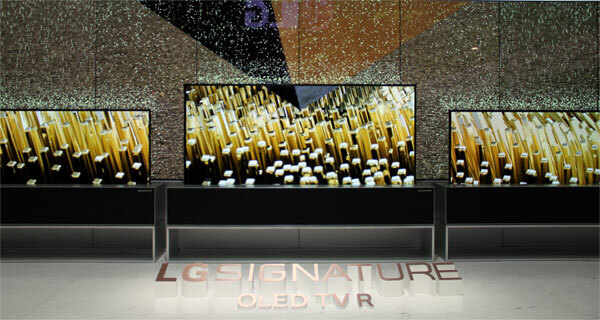 For LCD and OLED the challenge has always been to go big. With microLED, companies face the opposite challenge. 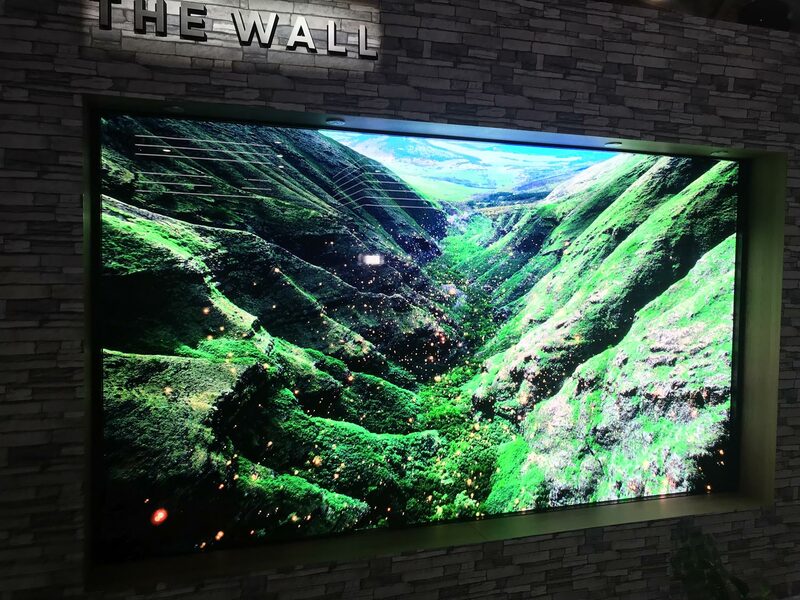 They can make very big microLED displays; the challenge is to slim down the individual LEDs enough to fit enough pixels for 4K – or 8K – into a smaller screen size. When can we expect the first microLED TVs in more living room friendly screen sizes? Samsung told us to that it will take ”between 1 to 9 years”, which doesn’t even qualify as an estimate. It probably means that we will have to wait at least a couple more years but in the meantime we expect to see microLED employed in backlight for LCD displays. 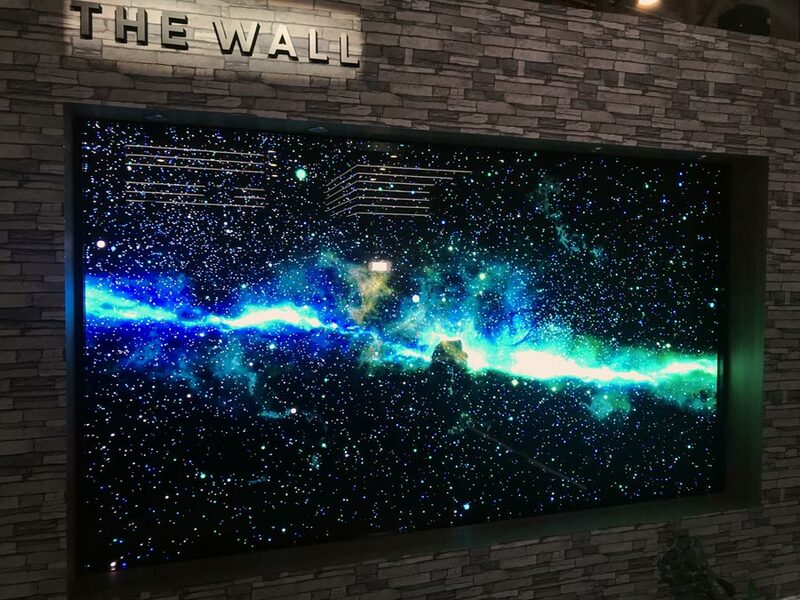 In fact, Samsung showcased an 85” Q9S 8K TV that appears to use microLED for dimmable backlight zones (more on that later). 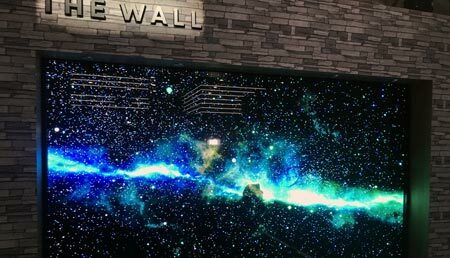 Despite refusing to about the specifics of The Wall, Samsung was very eager to talk about the future roadmap for microLED (and QLED). 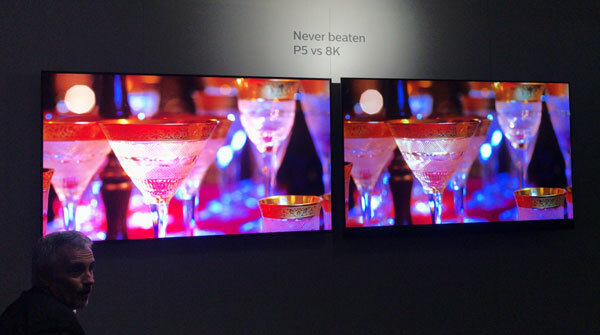 The Korean company claims that microLED will eventually be capable of hitting peak brightness levels of 1,000,000 nits, nanosecond response time, and 5000 ppi (pixel per inch) density, while keeping power consumption in check. Perhaps, who knows, but The Wall is a strong first showing.